This supernatural horror/thriller has two distinctions: it's the first new release of 2014 and another installment in the highly successful, low-budget franchise. Unlike its predecessors, it's not set in a haunted house in middle-class WASPy suburbia. Instead, the story shifts into a working-class Latino apartment complex in southern California -- with an ethnically diverse cast of characters. It begins as Jesse (Jorge Diaz), a recent Oxnard High School graduate, awakens to find an odd bite mark on his arm. Pretty soon, he's experiencing some extraordinary powers, like the ability to levitate himself and others, along with inexplicable mood swings. This mystery coincides with the sudden death of Jesse's downstairs neighbor, reclusive Anna (Gloria Sandoval), whom many suspect was part of a coven of witches performing Santeria blood rituals. Curious, Jesse and his friend Hector (Jorge Diaz) peeked into Anna's apartment after the police left, unearthing her collection of occult artifacts and documenting their discoveries with Jesse's new camera. When Hector and Jesse's sister, Marisol (Gabrielle Walsh), become increasingly concerned about Jesse's transformation and increasing inability to control his violent temper, they consult Ali (Molly Ephraim), who recognizes the telltale symptoms of demonic possession. And so it goes. Screenwriter Christopher Landon, who contributed to earlier sequels, directs, and it's certainly a step up from the last chapter, "Paranormal Activity 4," which was truly disappointing. One of the elements introduced this time `round is the sinister use of Simon, an electronic Milton Bradley game, which begins answering yes/no questions like a Ouija board. Fittingly, in the finale, it adds to and expands the previous mythology, as a harbinger of "Paranormal Activity 5," which is scheduled for an October release. For those who have forgotten or missed the 2009 original, the basic concept is based on "found footage," similar to "The Blair Witch Project," but focusing on various incarnations of a malevolent spirit named Toby. 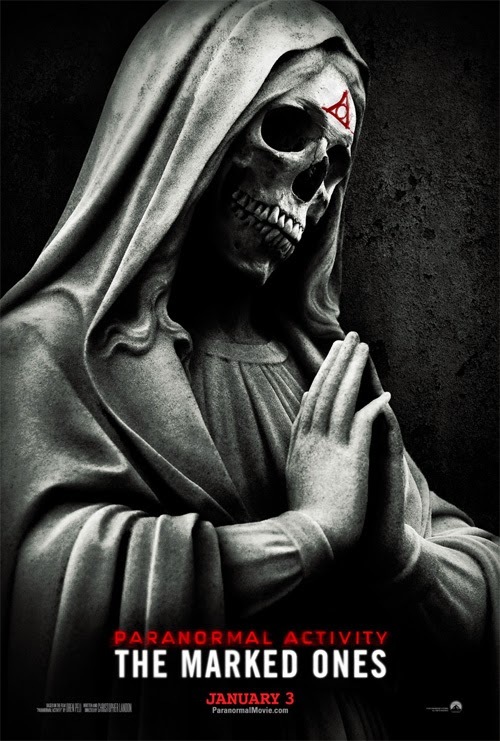 On the Granger Movie Gauge of 1 to 10, "Paranormal Activity: The Marked Ones" is a fright-flick 4, a spin-off that's specifically aimed at adolescent Hispanic chiller/horror fans.